Acknowledgements My sincere thanks to Frank Selkirk and Catherine Arthur who live in Lucainena and have helped me with my rambles around the mine and railway remains. 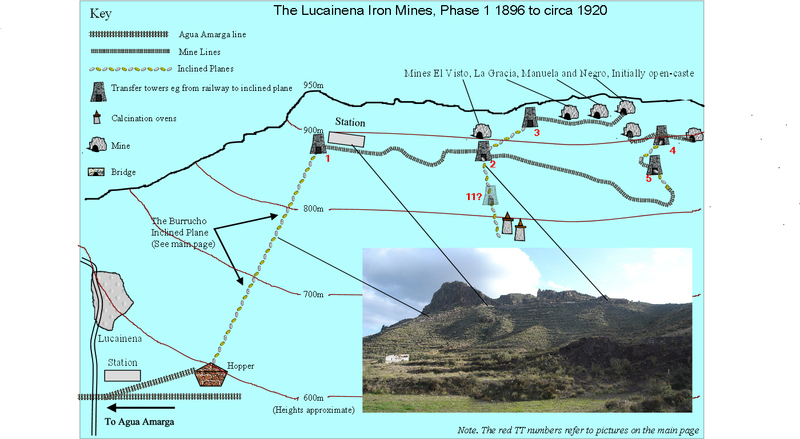 Much of the history of these mines and the source for my diagrams derives from the book "Trenes, Cables y Minas de Almeria" by Jose Martinez and Jose Navarro. 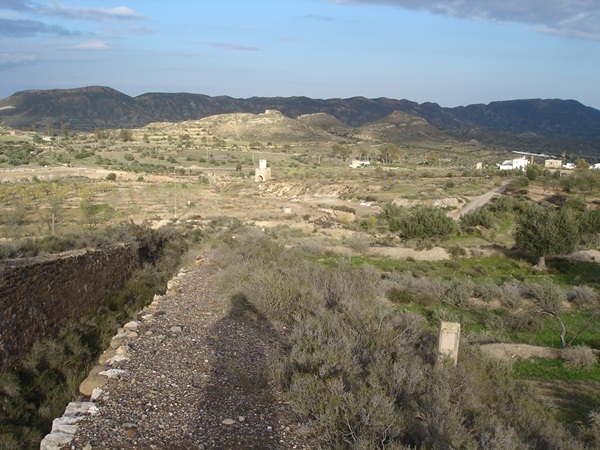 This was one of the more successful of the mining ventures in Almeria, mainly because it had better planning and better investment. 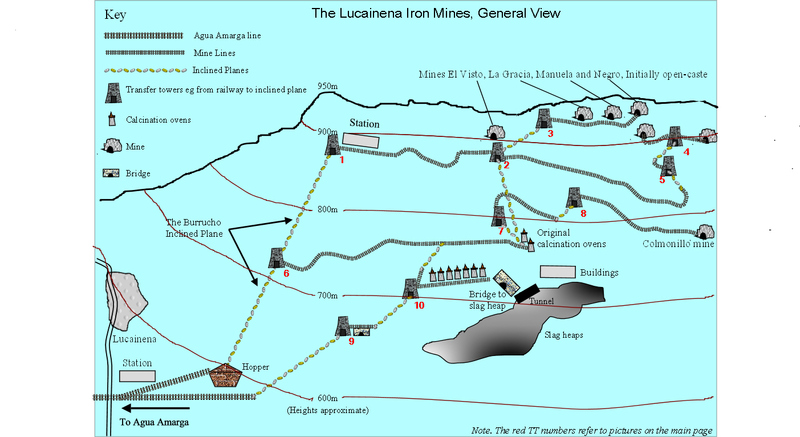 A line ran (see map) from mines in the mountains of the Sierra Alhamilla in the parish of Lucainena to the coast at Agua Amarga. 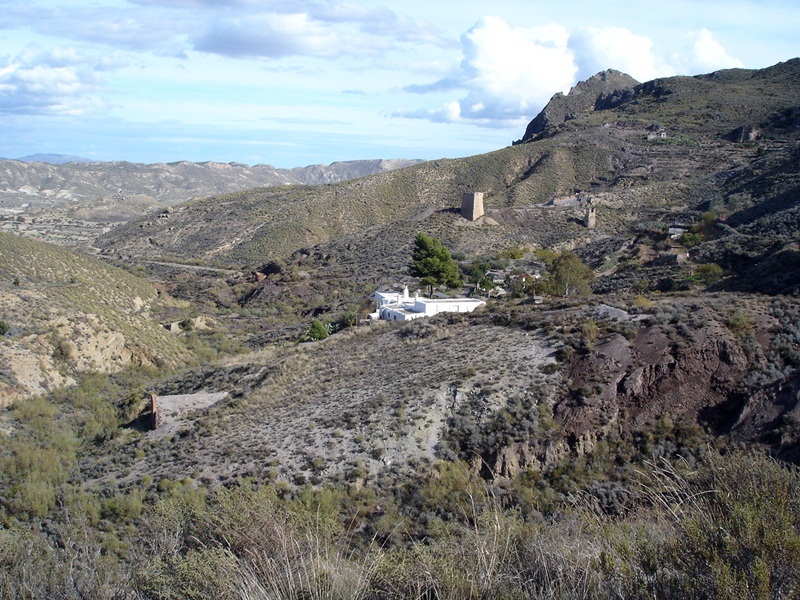 A consortium, the Mining Company of the Sierra Alhamilla (CMSA) was formed to exploit the mineral deposits there. It consisted of a number of mining engineers, managers and venture capitalists. These had already formed or belonged to successful companies in the Basque region of Spain. At least one of them, Juan Luis Lecoq, was involved with the construction of the GSSR. 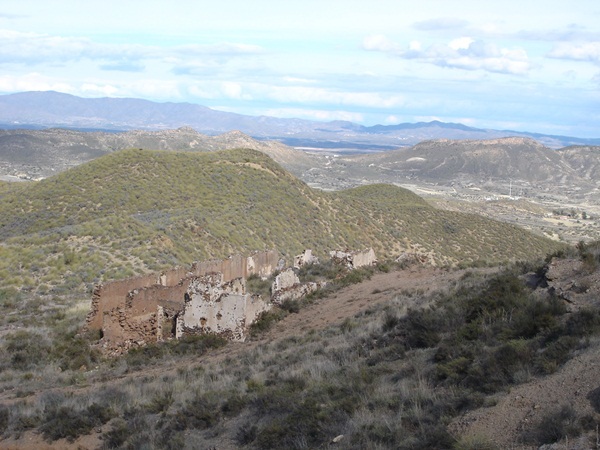 Another, Herman Borner appears in the stories of the Baños and Almagrera lines (in fact early on, Borner had wanted to link these mines to the Baños line, thus exporting the ore in Almeria). However, after disagreements over money, Borner was dismissed from the CMSA. 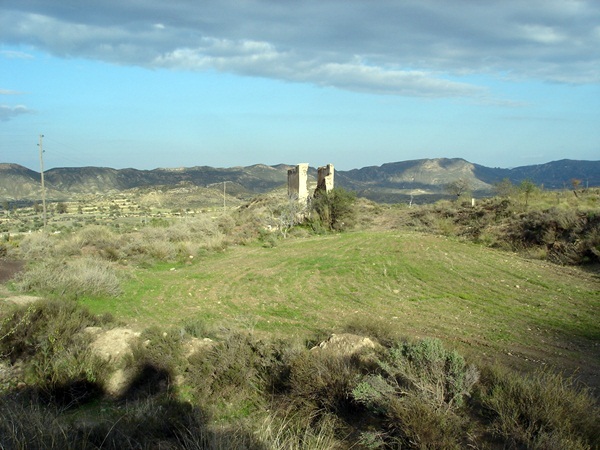 The mines being some 30 km from the sea (the only practical long distance route in those days), either an aerial cable or a railway was needed. Given the terrain, a cable was easier but it was a long way and reliability could be a problem so a railway was chosen. There were several possible locations for the loading of the ore on to ships, all of them involving steep gorges. 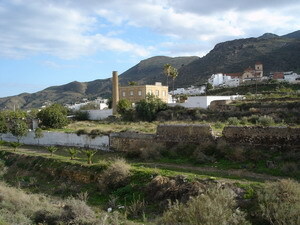 The one chosen went just to the left of the small village of Agua Amarga, which means bitter water, a reflection of the quality of that liquid from the wells there. In 1895 a Royal Order granted the concession for a railway for 99 years. Work started and the line was completed in 1896. 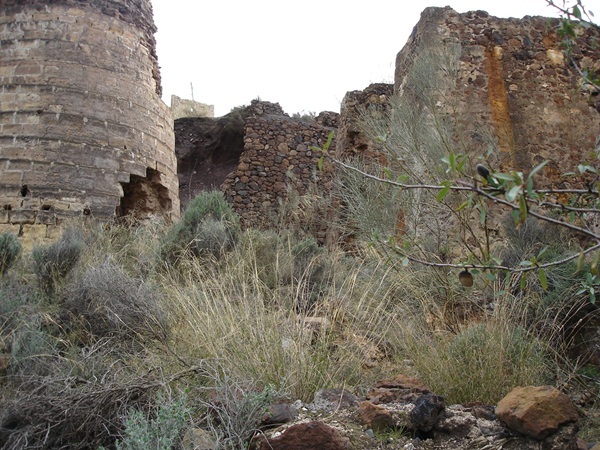 At the same time it was found that the iron ore contained iron carbonate. This would have to be burnt off in what are known as calcination ovens (see below). In 1898 the upper line was extended. At the same time an inclined plane was constructed to two calcination ovens. 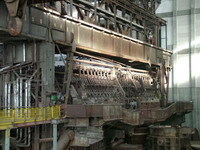 The calcined material was then taken back to the upper line (at that time the only one constructed). The ore was, as was common, available at first by open cast workings. 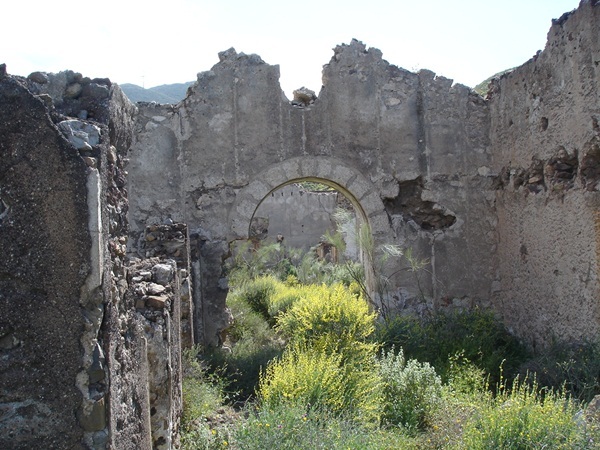 These were soon exhausted and tunnels and galleries were built. Work started at the upper levels and gradually came down as the seams were exhausted, having in many cases yielded over a million tons of ore. 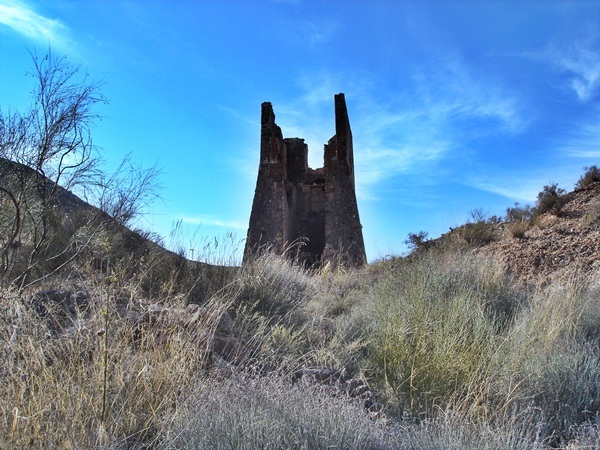 In 1900 more work was carried out as mining progressed down the mountain. 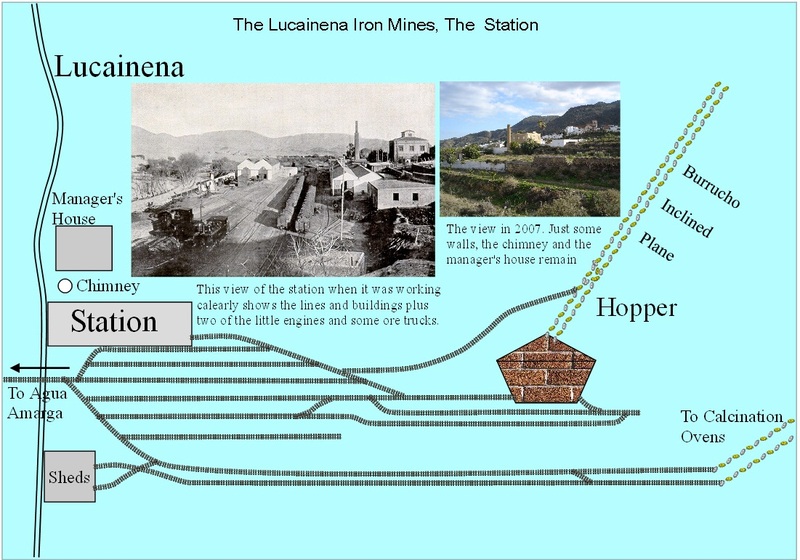 A 1,500 ton hopper was built next to Lucainena Station capable of moving 1,000 tons of mineral per day. Also eight more calcination ovens superseded the two earlier ones. A network of narrow gauge lines appeared as well as various inclined planes. As mining expanded, so did this network until it was some 5 km long. The number of inclined planes rose to eight. Inside the mines mules (and men) hauled the wagons. 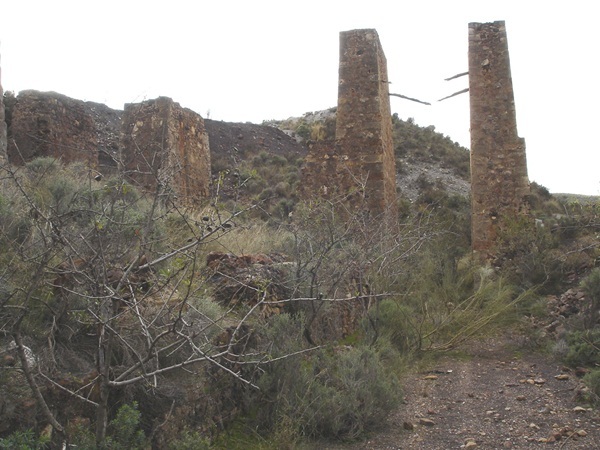 To get from the mine entrance to the ovens then the main line depended on the mine’s location. At the higher level there were linking lines, some operated by steam locos. Others used inclined or level planes operated by electric or steam motors. As work moved down the hillside, old lines and planes were dismantled and new ones built. See the diagram links below. The journey for a lump of iron ore could be quite complex. Dug out of the pit face - carried in esparto baskets to the internal mine line - loaded onto a wagon - taken along a mine track by mule - taken along an outside track by steam engine, possibly also down an inclined plane - Put into a calcination oven - heated - taken out and washed - loaded onto another inclined plane wagon - taken to the main line and loaded onto trucks - taken to Agua Amarga - put onto another inclined plane and loaded into a hopper - taken out of the hopper and loaded into another wagon - pushed by hand to the pier - tipped down a chute into the ship’s hold! And this does not include any operations at the destination! The company made good progress and paid regular dividends until WW1. The early 1920s saw a price crash in ore (see my book on the GSSR) which caused many to go under and seriously damaged the CMSA. 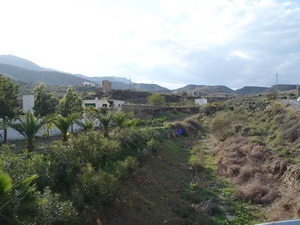 The huge hoppers at Agua Amarga (see below) were full because no-one wanted to buy. The company made a loss for the first time. There was a short recovery but like the GSSR, it was a downward path to closure which eventually came in 1942. 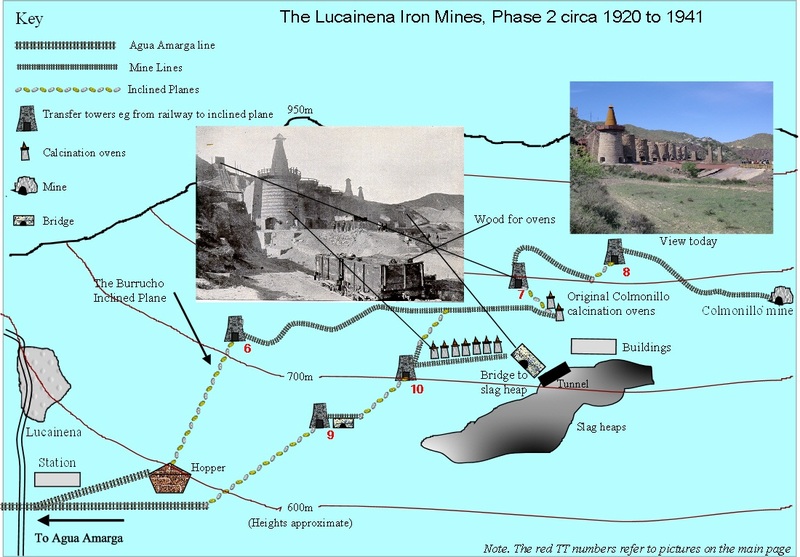 Below are some links showing how the mines developed. Click on the browser back arrow to return to this page. Note. Some of the pictures refer to "TT" and a number. These refer to transfer towers where, for example, an inclined plane became a railway. These TT's are numbered and located on the general diagram above. 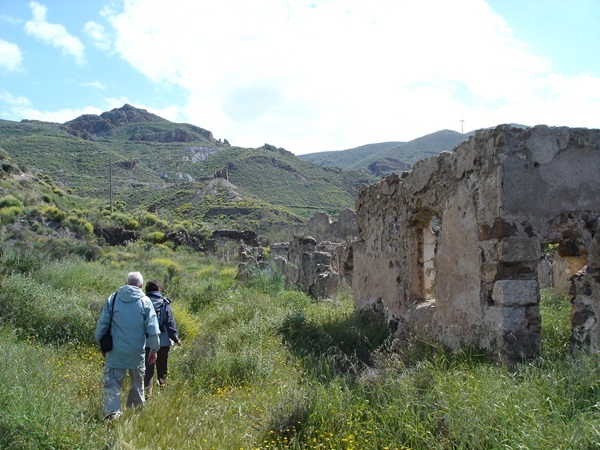 My researches, with the invaluable help of Catherine and Frank, have been able to trace many of the remaining artifacts of the mines. Where items are definitely correct, I have shown them without further comment. Where there is some doubt, I have indicated so in my description. However, there are still some things that have a big question mark over them. Perhaps one day these may be resolved, but in the meantime they remain a puzzle. Left. Here were located a station, workshops, stores, a steam electricity generator (later diesel), the management office and hoppers. Among the station buildings were the maintenance workshops, forge, boiler repair, inspection pit, and store. Little remains today except the manager's house (centre), now a workshop and the chimney of what may have been the steam-driven power station.The workshops and sheds were to the front and left of the picture as were the various sidings. Part of the platform area has been leveled.An old picture of the station in operation is on the station diagram, link above. Right. Looking from the station towards the mines, only trackways are visible. 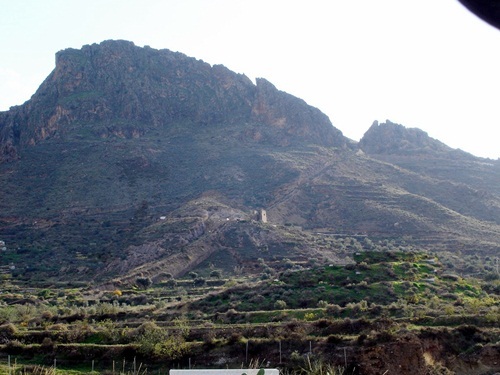 The initial workings were at the top of the mountain to the left. 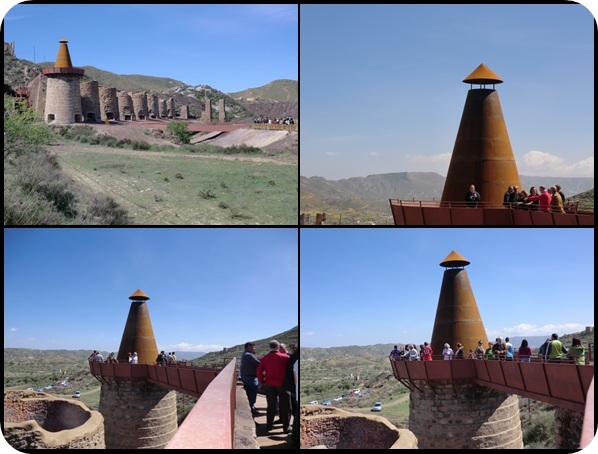 The ore came down on a huge inclined plane, called the Burrucho plane. It reached the line somewhere in the middle distance of the picture, passing in front of the white house that can just be seen centre left on a rise. Later ore came down a different plane straight ahead. TT9 can be seen in the distance, behind the small white building to the right. Left. 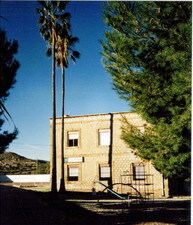 The manager's house still stands behind the station. Today it is used as a primary school. Right. The Burrucho inclined plane went straight up the mountain to the top where the initial workings were. TT1 can just be seen at the top. When the workings were moved half-way down the mountain during phase 2, the top half of the plane was abandoned and a new transfer tower (TT6) built. Right. Further along the mountain top were the workings. They were reached by a series of railway lines and short inclined planes. The workings eventually extended well to the right of the picture. Left. The short rail link from the calcination ovens to TT10 crossed here. This then went down an inclined plane to the rail link which led directly to Lucainena station. Right. A close-up of the remains of TT10. Left. Looking down the inclined plane to TT9. The line then turned right to the station which is on the right in the distance. 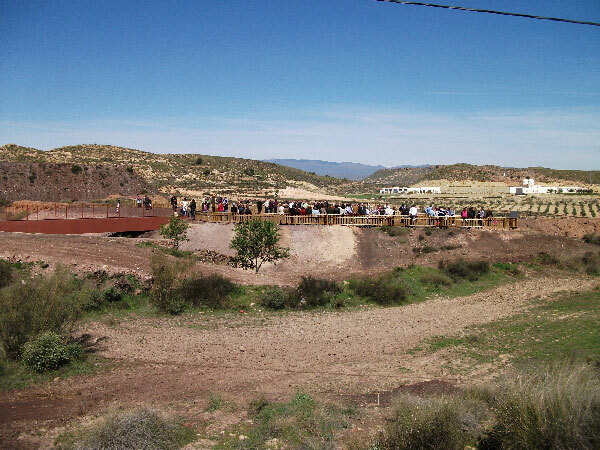 The remains of the bridge across the arroyo just before TT9 is there but is not really visible in this picture. Right. 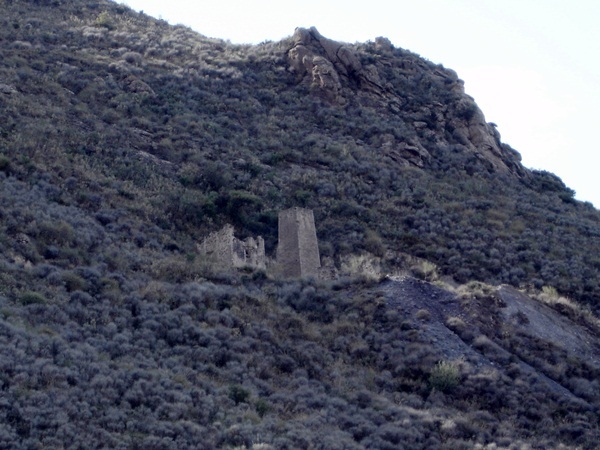 Looking up from the left of the calcination ovens. TT7 is at the top. Ore from the Colmonillo mine arrived by this means. Left. The remains of the bridge that led to the spoil heaps. Right. Looking up from the right of the calcination ovens. More remains of the bridge. TT7 is on the horizon. 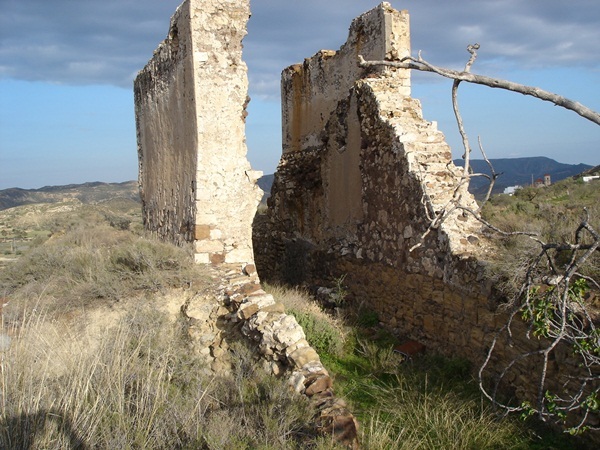 View from behind the calcination ovens before restoration (the area has now been levelled). I am not completely certain about the way this all worked. In the old picture showing the ovens working one can just see the wall of the area shown in this picture, but there is no indication of any link from the inclined plane to this hopper. Instead, the plane goes down to the foot of the ovens. However, according to the description given in Trenes, Cables and Minas, ore was bought from the mine to somewhere near TT7. It was then sorted by hand into ore and rubbish. 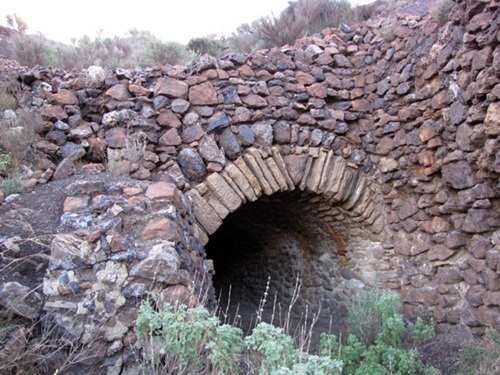 The rubbish was taken over the bridge and dumped while the ore was loaded into the top of the calcination ovens. Which is all very well, but how did the sorted ore get to this area? Also, what was the purpose of the inclined plane? Things are not clear. Travelling a bit further past the ovens, there is a short tunnel. 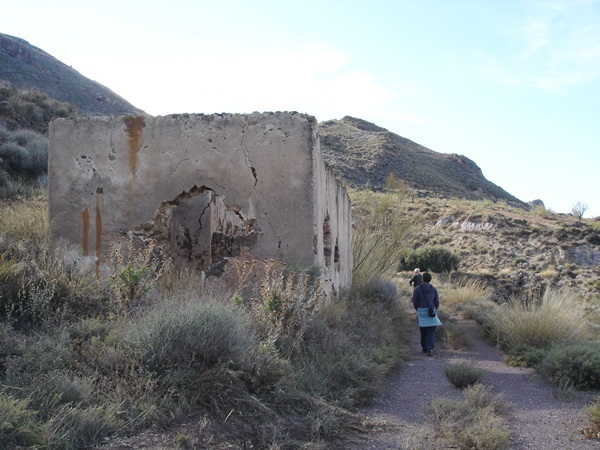 This leads to what I an pretty sure is the remains of the electricity generator and some other buildings, probably stores and a workshop. I think that the tunnel just gave access to these buildings and never had a rail link on it.The generator would have driven the inclined plane motors. Or IS this the generator building!? See another picture below of some more buildings. These pictures pose more questions than they answer. Looking at the main picture on the left, at the centre left is an obvious calcination oven. Unless there is another unknown oven, this has to be one of the two earlier ovens that were built near TT7. This would make TT7 the large tower on the hill. But what is the smaller tower to the right? It's too close to be TT8. I think it may have been TT11 and used in phase 1 to bring and return ore to the early two ovens. The ruins top right would thus be the start of the short inclined plane from TT2. The track leading away left from the oven could well be the line of the lower railway (phase 2) to TT6 halfway down the Burrucho plane.Finally, what is the structure lower left? It looks like a tunnel, but to what? The smaller picture on the right gives a close-up of the oven. These five pictures were taken from fairly high up towards TT8. The information I give for these is only an educated guess. Some dedicated research is needed - any offers? 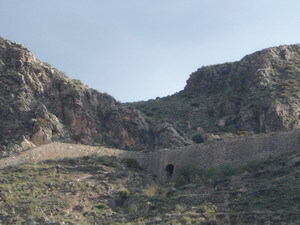 Picture 1 is taken from higher up the mountain than that showing one of the calcination ovens. This is hidden by the buildings. Although it is not possible to see from the picture, when I was there, I was sure I could make out the remains of the second oven. Are these the generator buildings? I still favour the buildings above but perhaps they both were? Picture 5 is also from phase 1 and may be of TT4 or 5. Certainly there are signs of open-caste mining behind. 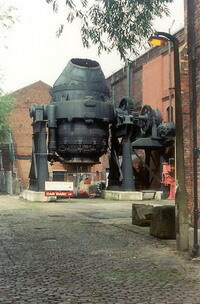 The steelworks in England at that time used either the Bessemer process (left picture) or the “acid” process (a clay lining). Both of these required a sulphur content of less than 0.05%. 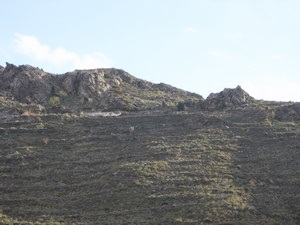 The Los Filabres ores that supplied the GSSR contained about 0.02% sulphur so the ore did not need calcination. 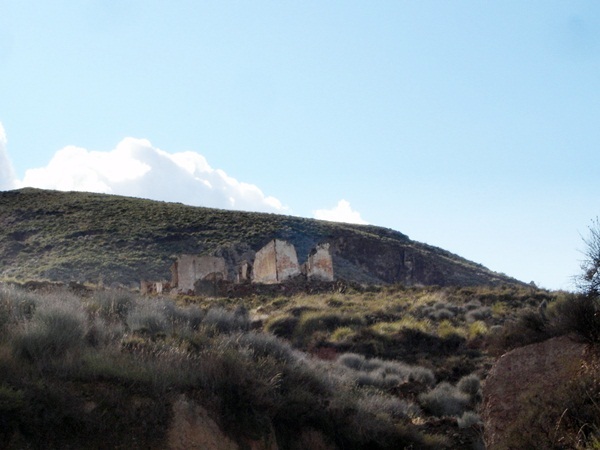 However, it must be assumed that the ore at Lucainena was over this limit as they had many ovens (centre picture). 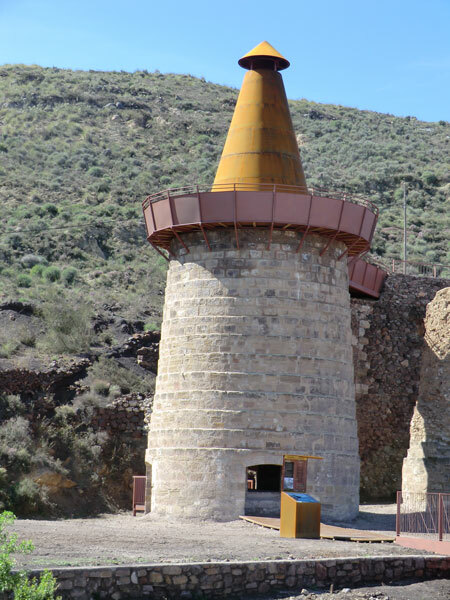 Where the sulphur content was high, the ore was placed in the Calcination ovens and heated, although not enough to melt the ore. By this method, impurities were driven off. Germany could smelt ore that was higher in sulphur by using a process known as “basic” (right picture) which involved blasting air through the system and using a special lining. This was improved in the 1950s by blasting oxygen instead of air. My thanks to Malcolm Hooper of Cornwall Croquet Club for the following information. Most iron ores are oxides – hematite, magnetite etc. These contain no sulphur. The smelting process reduces the ore using silica sand and lime to create complex silicates that float off in the slag leaving fairly pure pig iron. 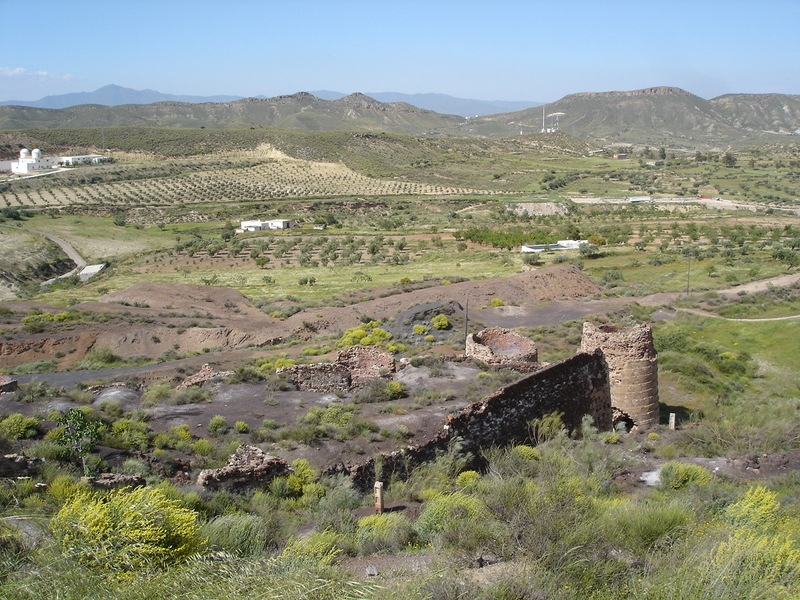 Iron was occasionally obtained from pyrite (FeS2), notably in Spain and Italy. In this case the ore is roasted first, driving off the sulphur as SO2 and oxidizing the iron, which is then smelted in the normal way. If the ore at Lucainena was pyrite I suspect that this was the purpose of the calciners. Tin ores occasionally contained high levels of arsenopyrite (arsenical sulphide). 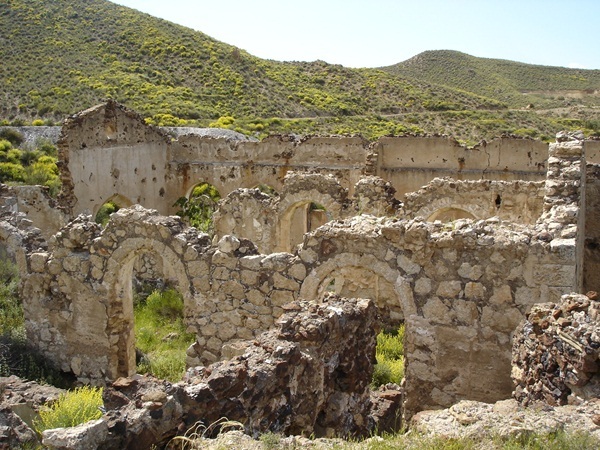 This is heavily penalized by the smelters and was removed by calcining at the mine. The arsenides sublimed and crystallized in special chimneys from which it was recovered and sold. This was a highly dangerous practice and there was a high workforce turnover! The principle of calcining/roasting is such that the ore is only heated sufficiently to facilitate the chemical reaction. It is not melted. As a consequence the energy requirement is not excessive. I don't believe the loss in weight (transport) would have been the prime reason to treat the ore on site. 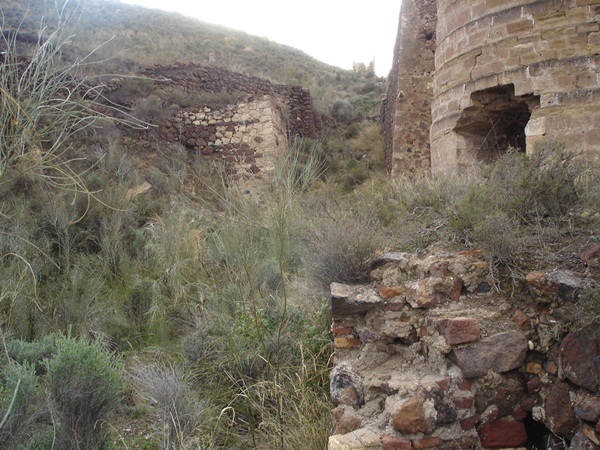 The penalties for impurities at the smelters were high and the relatively low level of heat required would probably have come from wood or coal, that was reasonably available in the past. Also the technology is low – simply an oven. It was evidently economic to do this at the mine. There is a very good description of steel making on Wikipedia. 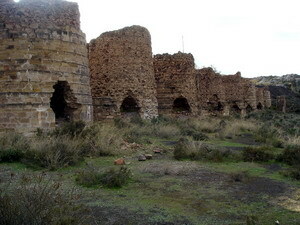 In 2011, work finished on an extensive restoration of the ovens. Unfortunately I was unable to attend the opening ceremony, but Frank kindly sent the following pictures. Select here to continue to part 2 the railway and the ship loading bay. 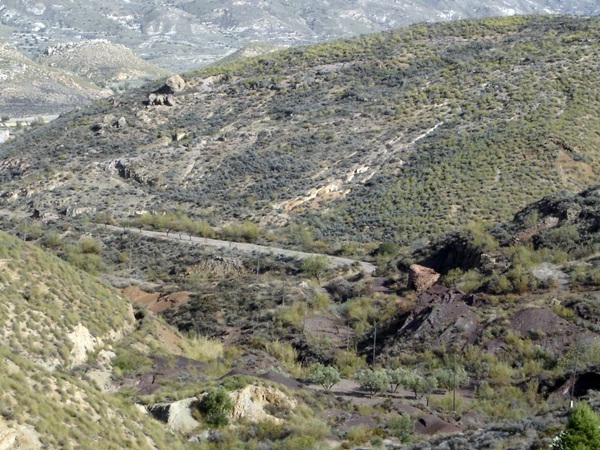 Trenes cables y minas de Almería. In Spanish by José Antonio Gómes Martinez and José Vicente Coves Navarro. Nasmyth Wilson and Co by John Cantrell gives the history of the company that built three of the engines.